There was a time when there was no cell phones and computers. The two faces of coin of life – happiness and sadness- though the terms are antonyms but, its mode of transportation were same via sharing our feelings. In the moment of happiness, we used to dance around with the people we love and in the moment of despair, we cried with the people we love. In midst of conflict, either we confront face-to-face like warriors or ran away like a coward. Now life is a tangled web of cell phones and hashtags. Happiness is shared via stories of Instagram, WhatsApp, Facebook and Snapchat. Sadness is also shared via same application either to get sympathy or to make other person feel awful infront of everyone without having a decency to confront face-to-face. Hashtags are added just to put emphasis on the fire that just burnt that road like #crappy_friend or #douche_boyfriend. These apps made our life so easier that we don’t have to deal with all the drama. One message and voila! problem solved! One tweet and all his/her hard works of lifetime get drowned all in vain. The cowards got a platform to act as a critic but it doesn’t change the fact that he/she is still a coward who’s hiding behind a screen. Family used to be an environment to share our emotions freely. Now it’s all about emoticons. Cells phones are bringing people from afar closer but keeping apart the people who are near. Somewhere all in this world of chaotic communication, we all have lost ourselves. We are stranded in the middle of nowhere and trapped under the spell of technology. We need to connect with the nature again. Instead of staring at the screen, look for the exquisite beauty of flora and listen to the cherishing voice of fauna and keep our phones off once in a while. Go out and get out of comfort zones. Nature do teaches you to fight your own battle like a warrior. Meet more people and greet them the old fashioned way. Who knows we might end up with the person with whom we wanna spend our life with. We can’t know a person via phones we need to understand that. Sometimes the old fashioned way is the route to all the clarity in the world. Explore more, learn more and grow more. Darwin Day is celebrated across the world on the occasion of birth anniversary of Charles Darwin. This day honors his life and contributions to science and also to promote science in general. He was an English naturalist and geologist, born on 12th February 1805 in England and died on 19 April 1882 at the age of 73. He is famous for his theory of evolution. His immense intellectual bravery, a perpetual curiosity and a ravenous hunger for truth in an attempt to understand origins of modern life inspire us. The world was unaware of how we were formed and why are we like this now. Our secret of origin was hidden and finally, this man came to lift it up. Darwin’s remarkable impact on biology, cosmology and scientific process can’t be ignored and will be remembered for forever. He wrote his theory of evolution in his book Origin Of Species. He depicted his theory via genetic variation and natural selection for which he is appreciated still now. Amanda Chesworth, who joined Stephens to officially incorporate the Darwin Day Program in New Mexico in 2000. In anticipation of Darwin’s bicentennial birthday on Feb 12th, 2009, the Darwin Day Celebration paired with the American Humanist Association to support the growth of Darwin Day activities. The American Humanist Association remains the lead agency charged with amplifying the International Darwin Day Foundation’s call for celebration, activism, and international cooperation for the advancement of science, education, and human well-being. Darwin day will inspire people to have intellectual bravery and immense curiosity to discover something hidden and lift up the truth. It’ll be a day of celebration, activism, and international cooperation for progress of science, education and human well-being. 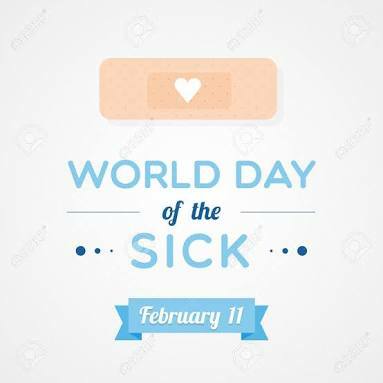 World day of the sick is celebrated every year on 11th February since 1993 when Pope John Paul II disclosed publicly that he was suffering from parkinsonism disease. It was a mere coincidence that the exact same day is the commmemoration of Our Lady of Lourdes. Now the question is “why the day is celebrated? ” Pope John Paul II was diagnosed with Parkinson disease on year 1991 and disclosed this one year later. He initiated this day on 1992 to encourage people to pray for the sufferers. He had written a apostolic letter Salvifici Doloris about suffering and believed that the suffering is very much salvific and redeeming through Christ. First time, this day was observed on year 1993 since then it’s celebrated every year. It is for all the believers who seek time to pray for people who is suffering right now from diseases even the people who are mentally tortured by the society for their uniqueness. People tend to pray for the mankind and a hope to heal for the sufferers. 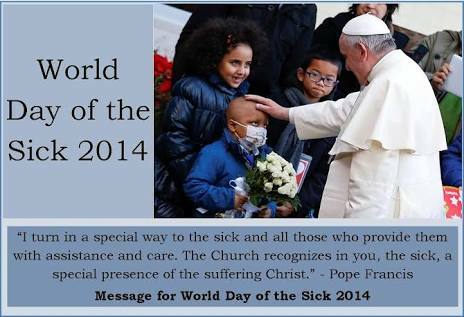 In 2005, this day had a special importance as Pope John Paul II died that year due to sepsis. In 2013, Pope Benedict XVI declared his resignation from Pope post during this day and cited his failing health as the reason. So, in the end, I would just say let’s just give one day to pray for poors and sufferers who are enduring hardships more than us. Whenever you’re in trouble, you always try to believe that there’s somebody who is suffering more than you but still smiling. Our today’s mankind is so self-absorbed and self-centered that we just care about ourselves . Let’s give one day to pray for those people other than us.